The filtered stem of your new Country Gentleman pipe comes ready to go with only one Medico filter, so you might consider adding a pack or two of our inexpensive filters to your order. Let me throw another 5-star review on the pile! The design of this pipe is just brilliant. The right weight, the right shape, the perfect bowl dimensions for cool burning, and so pleasing to the eye. It's easy to clench and it sits on a table/desk without falling over. I have the gorgeous stained model and am in love with it. I smoke it frequently and clean it carefully and it shows no sign of wear except to acquire more character. Together with the impeccable service provided by Scott and Jandy, this purchase has brought me only pure satisfaction. I refer all of my pipe smoking associates to Aristocob! Been my go-to pipe for about 2 years now, and I just ordered another Country Gentleman, as well as six additional pipes..which I will review later. Can't say enough good things about the pipe, how well it handles, how cool it smokes, and how sturdy it is. 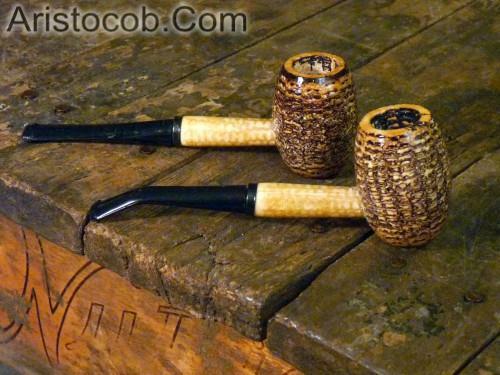 Had my initial doubts about how a cob pipe would hold up...but not any longer. I've ditched my very old briars in favor of a Missouri Meerschaum, and will have only Aristocob pipes in rotation from now on. And, the service from Scott and Aristocob is nothing short of outstanding....responsive to questions and comments, great prices, and true customer service. You will not be disappointed with a MM pipe, and Aristocob will not let you down, either. Thanks, Scott! This pipe is NUMBER ONE in my book!